What and Who is Girlfriend Social? Girlfriend Social is the largest women-only worldwide friendship making website available. Established in Jan, 2009, GFS is growing at an amazing pace. Girlfriend Social is free for all women to sign up, create a profile and talk to other women. Girlfriend social allows women to share and bond in whatever ways they are comfortable. Local Friendship searching, matching and Private messaging is all inside! We also manage a popular women themed blog and social media channels that includes women themed positive stories under the Girlfriend Social Brand. Girlfriend Social is a free website that helps women meet other women around the world to develop friendships with. We are the largest website for women only - where women of all ages and backgrounds can come to talk, share and bond to make new female friends. Amanda is the driving force behind Girlfriend Social. She currently lives in Toronto, Ontario, Canada. She's the one that has done every single part of the website you see here - from full stack development to marketing and support. With an ever-growing base of fans across all social media channels, she is a tour-de-force in many technical areas, and social areas. 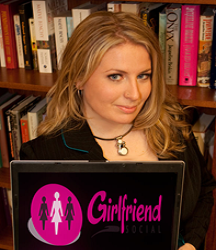 Girlfriend Social, based in Toronto, Ontario, Canada, is currently available for women all over the world. What are you waiting for? You could be meeting new women in just a few minutes. Sign up now!